Welcome to the Fit Small Business Xero training course! In this lesson, we’re going to cover how to set up organization and financial settings in Xero. Why Is It Important to Set Up Organization and Financial Settings? The information that is required to set up the organization and financial settings section affect just about everything that you do in Xero. In the organization section, you will provide basic information such as the address, telephone number and email address of your business. This information will appear on customer invoices, credit notes and purchase orders that you create. In the financial settings section you will include information like your fiscal year, business entity (S Corp, Sole prop etc;) and sales tax. The information that you provide in this section is used on all financial reports, tax returns and other financial documents. Next, we will discuss all of the information that you will need to gather in order to set up your business in Xero. In order to make the most of your time, it’s important that you have access to key documents and other information that you will need in order to set your company up in Xero. While it’s not required that you set up everything all at once, we recommend that you provide as much info as possible. This will prevent you from having to fix something later on, which will save you some time. Here is a list of some of the key documents and questions that you will need to answer as you walk through the Xero setup guide. You can click here to download the checklist as a PDF. Do you need to create estimates/bids/quotes? Do you need to track income and expenses by location or department? What date do you want to start using Xero to track your day to day business? Do you charge customers sales tax? *These items are only required if you are an existing business. However, if you are a brand new start up then you do not need to worry about having these items. How Do I Set Up Organization and Financial Settings in Xero? When you first log into Xero, you reach your dashboard. The dashboard gives you a snapshot of important financial information, such as invoices owed to you, bills that you need to pay and bank balances. Step 2 – Within the Organization screen, you can edit both the Organization settings and the Financial settings as indicated in the screenshot below. We will walk through organization settings first and then discuss financial settings. In “Organization settings,” you will enter basic company info that will appear on customer invoices and quotes as well as financial reports. You can pick and choose what information you want to appear on your customer invoices by selecting the “On” option as indicated in the screenshot below. Display name – This is the company name that you will see in Xero. 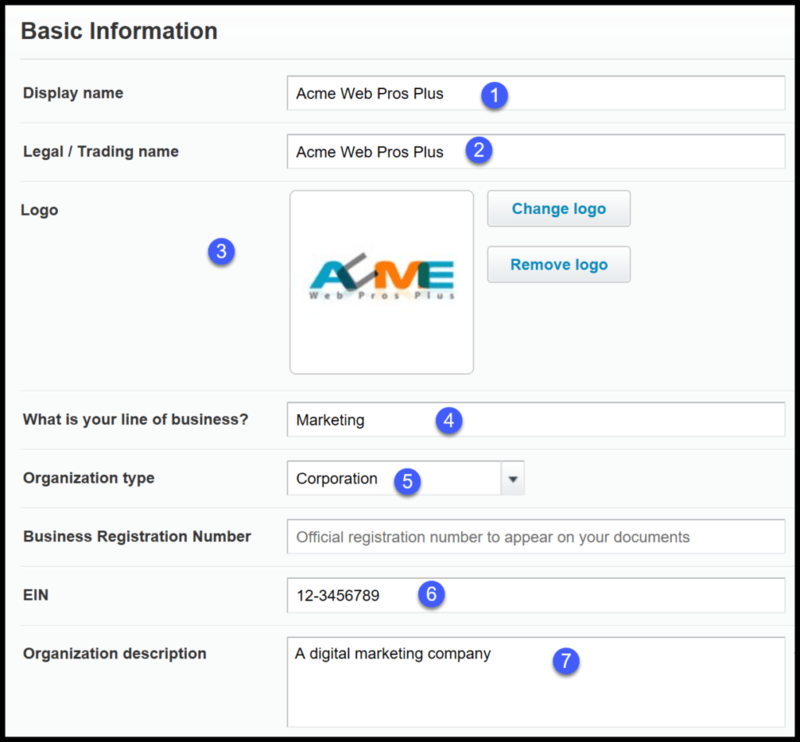 Legal/Trading name – If your company name (DBA) is different from your legal name, then be sure to enter your legal name in this field. The company name that you enter in this field will appear by default on financial reports and all outgoing invoices, quotes and other documents. Logo – If you have a company logo, this is where you would upload it. This logo will appear with your profile in the Xero Business Community. This is a community of other Xero users that you can connect with to get answers to questions as well as learn great tips on how to use Xero. In addition, this logo will appear on all outgoing invoices, quotes and other documents. What is your line of business – You can enter a brief description of what your business does. Based on previous descriptions entered, Xero will make suggestions. However, if you cannot find something that best describes what you do, you can enter your own unique description. Organization type – Select the legal structure of your business. (i.e. Corporation, Sole Prop, S Corp etc;). This information will be used to complete tax returns and other financial documents. EIN – Your employer identification number belongs in this field. If you don’t have an EIN, you can enter your social security number instead. This info will be used on tax returns and other financial documents. Check out our guide to find out if you need an EIN. Organization description – You can enter a brief description about what your company does. This information will appear in the Xero Business Directory. Entering contact information in Xero. This information will appear on your invoices and other documents you send clients/customers. 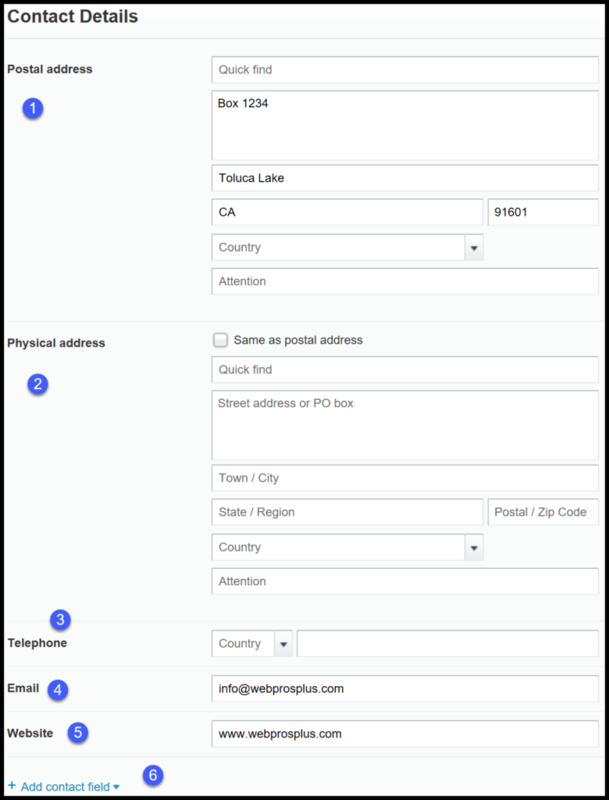 Postal (mailing) address – In this field, enter the address where you would like to receive customer payments and other important business correspondence. This address is also used for check remittances. Physical address – If you have a physical address that is different from your postal address then enter that info in this section. Otherwise, just click the box that says Same as postal address and these fields will disappear. Telephone – Enter the telephone number where customers can reach you. Email – Enter your business email address where customers can email you. Website – If you have a website, enter that information in this field. Otherwise, you can leave it blank. Add contact field – In this field, you can enter any additional ways you would like to be contacted either via phone, fax or social media channels as indicated in the screenshot above. Financial Settings includes information that will affect your financial reports as well as how sales tax is tracked and reported. It is important to set this information up so that your financial reports are accurate and your sales tax is tracked and reported correctly. If you need assistance with completing this info, contact your accountant or you can check out the Xero Directory which includes a list of accountants and bookkeepers who are certified Xero experts. Below is a screenshot of the information required in this section along with a brief description of each item. 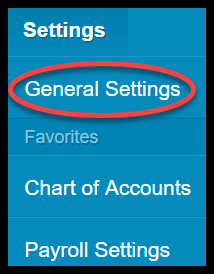 Financial Settings Set up in Xero where you can indicate accounting method, tax id and your tax year. This info will be used on reports and other financial documents created in Xero. Financial Year End – Indicate the last day of your fiscal year. Most businesses use a calendar year, (December 31) which is the default in Xero. However, if your fiscal year runs July 1 through June 30 then you would select June 30 as your financial year end. Sales Tax – The information in this section will be used to track and report sales tax that you collect from your customers. Tax Basis – Select which method (cash or accrual) you are required to use to report sales tax. If your state requires you to use the cash method, then you will report sales tax based on when you receive payment from your customer; however, if your state requires that you use the accrual method, then you will report sales tax based on when the sale is made. Be sure to check with your accountant if you are not sure which method to select. Tax ID Number – This is the same as your EIN that we discussed in the previous section. If you don’t have an EIN, you can enter your social security number in this field. Tax ID Display Name – Enter the legal name associated with your EIN. Tax Period – Indicate how often you are required to report sales taxes to your state. This generally depends on how much sales tax you collect. Most businesses must file on a monthly, quarterly or annual basis. Tax Defaults – In this section, indicate what the default tax settings are for sales and purchases. There are 4 options to choose from: Tax exclusive, Based on last sale, Tax inclusive and No tax. Below is a screenshot of this field along with a brief explanation of each option. 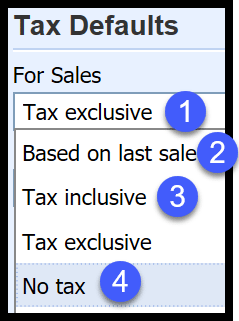 Tax exclusive – This option will show tax separately on invoices and credit notes (or purchase orders) that you create. For example, if you invoice a customer for products that cost $100 and you charge 8% sales tax, there will be a separate line on the invoice to show the sales tax calculation of $8.00 ($100.00 times .08). Based on last sale – By selecting this option, the invoice would follow the format your last invoice took: either tax inclusive, tax exclusive, or no tax. 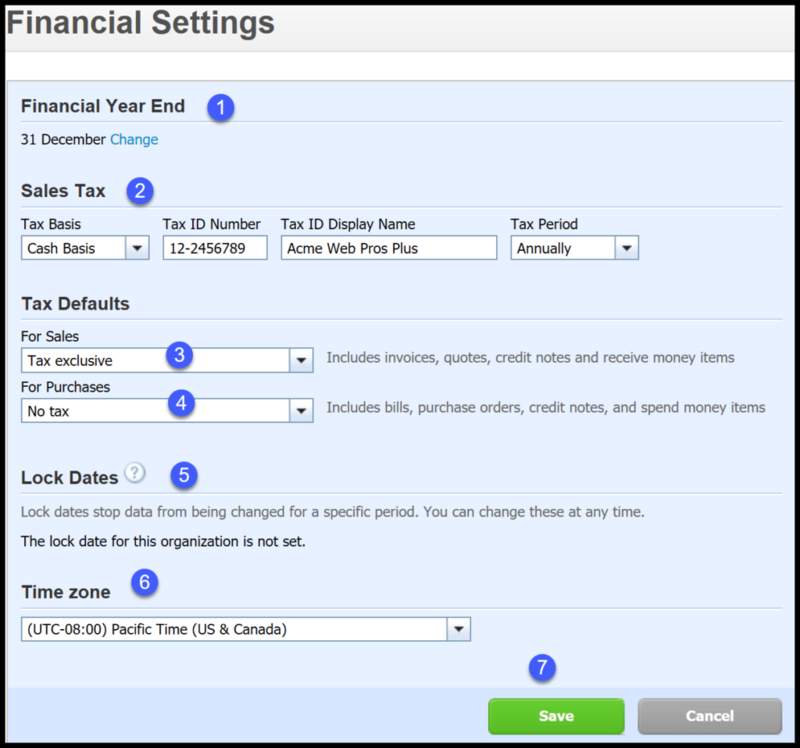 That wraps up the section on how to set up organization and financial settings in Xero. The next lesson in our Xero Training Course will be how to customize invoices, quotes, purchase orders and receipts. In this lesson, we will walk you through how to change the look and feel of invoices, quotes and purchase orders. To access this lesson or any of the others in the series, click here. For a free 30-day trial of Xero, click the button below.